Lewis, this is like living in the wonderland that your Alice dreamed about. Each month there is more madness. The finance websites and pages are a hoot. We have patronising commentators looking at the chaos as if it was an organised tea party with a slight flaw in the jam on the cream scone. Some of our financial persuaders have already decided that victory can be grabbed from the wreckage. The phrase victimless crime has been used to try and spread calm. Barclays did not alter the Libor rate they insist. True, they tried to rig and fiddle but it does not matter because everybody was doing it and those banks that were trying to lower the rate would have been cancelled out by the other banks trying to raise Libor. No, says one expert. Attempting to fix the rates is not a scandal at all. The real scandal, and we should all be shocked by this, is the failure of the regulatory structure to stop the banks trying to adjust Libor. With intellect like that no wonder the financial services industry is in a mess. The attempt of the banks to fix the Libor rate was futile but those dreadful civil servants did nothing to stop the banks doing something that was …. Yes, you have finished the sentence before me…… well, futile. The people who are making such arguments are not completely stupid. Admittedly, they have inadequate sensibilities but their shortcomings are disguised in impeccable measured tones and, more important than this style designed to deceive both them and us, they understand their interests. What we have to endure now, apart from avoidable poverty, is a smokescreen that insists we only believe that smart middle aged men who sit behind large City desks have understanding and knowledge. If nothing was to be gained why the ecstatic emails between traders and the inevitable exchange of bottles of Bollinger? One trader who was interviewed by the Telegraph newspaper made it clear that it was in the interest of the bank to claim it was borrowing at low rates and, of course, there were one off deals that would benefit from disguised interest rates. Meanwhile, the bonuses just kept rising. The trader said that there was a general acceptance that you lowered the price a few basis points each day. Nobody checked because the banks with the support of Margaret Thatcher and later Ed Balls and Gordon Brown had convinced themselves and the rest of the establishment that they could be trusted. Notice, that this was a debate that existed within those that rule. This travesty was never discussed with the British people. Libor is the key rate in the $350 trillion derivatives market, so a half basis point move amounts to a $17.5 billion distortion annually. That sounds far from futile to most of us. On the BBC programme Question Time, the Unite Trade Union leader, Len McCluskey proposed that the UK had an investment bank that could lend money directly to companies and businesses. Some moron in the audience countered immediately. ‘We don’t want the Government interfering. Leave this to the private sector.’ Len gave the idiot a tolerant smile. Actually, macro finance is something that Governments, mainly because they are so powerful, can do well, especially when they ignore the IMF vampires. In 2009, the banks were given by ‘inefficient government’ £1.3tn of taxpayers money. The next year, the bank directors paid themselves £90bn in profits and bonuses. David Cameron is in charge of a government that has authorised repeated ‘quantitative easing’. The result has been a double dip recession and banks holding £750bn of cash not invested. There is no demand in the economy for businesses to make money. Why not? Because we are too busy giving money to the banks rather than giving cash to the people so they can buy goods. We are taking money from ordinary people to give to spivs whose only saving grace is that their actions are ‘futile’, without consequence. But if that is true how did we get into a £1.3tn mess? I know, they think we are daft. 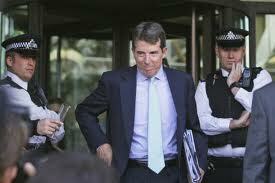 Meanwhile, good old Bob Diamond was reluctant to resign but money and share prices talk and the resistance was brief. 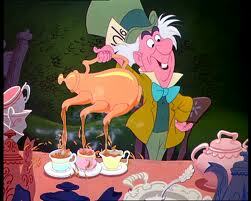 He is where it really became daft and Alice In Wonderland logic prevailed. In 2001, Barclays closed 171 branches in the UK, many of them in rural communities. In 2009, Barclays was criticised for excessive tax avoidance. Bob is the man who in January 2011 said this, ‘period of remorse and apology for banks……needs to be over.’ I am not sure if I want to take a breath or suffocate. Less than 12 months later, Bob opens his mouth again to reveal this gem. ‘I urge bankers to be good citizens.’ He was giving a BBC Today programme lecture at the time. With his bonus of £6.5 million most of us would find it hard to be pious (never mind good citizens) but bankers are different. They rob ordinary people, destroy businesses needlessly, demand austerity for innocent populations, insist on shrunken welfare states that will condemn many to misery and somehow it makes them self-righteous. They have a brutality that unchecked will destroy us all, a belief that in a world of supposed counterbalancing futility only the callous have existential strength. That damned woman, Ayn Rand, will just not go away. The belief, though, is phony. This self-serving deceit is exposed every time there is an enquiry into serious corporate fraud. These men are only strong when they are protected by committees and corporate power. Take that away and they wilt like the nerds they often were before they became rich. 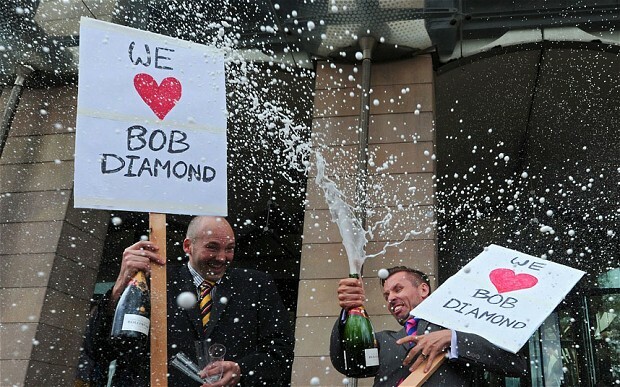 Bob Diamond is a big sports fan. He supports the Red Sox in Baseball, Chelsea in the Premier League, the Patriots in American Football and the Celtics in Basketball. The number of teams and the need to have a team in every sport is consistent with his £6.5m gluttony. Diamond is supposedly an advisor to Conservative Mayor of London Boris Johnson. The intellectual support must have been considerable because Boris is one of the few politicians who openly support bankers. Normally, the Tories defend the interests of their sponsors in the financial services industry by acting indignant and doing absolutely nothing. No, none of this shabby bunch compares to Elvis. But we have had thirty years of what was always obvious madness and living through neo-conservatism is as protracted a disaster as the failed policies of Colonel Parker. There was always another bad movie around the corner just as we know the neo-con establishment will always have another scandal and more waste. Such results are the consequence of the flawed bigots who run banking systems and waste talented musicians. Parker was not useless because he misunderstood the world was changing in the mid-sixties and ignored brand new ideas that could be learnt. His true crime was before then. He believed that something existed before Elvis that needed to be resurrected. 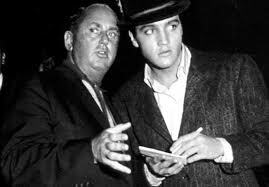 Parker thought he could apply the career of Bing Crosby to Elvis. When the 60s musical revolution happened he ignored not only what was happening then but what had happened earlier in the period between Crosby and Elvis. The neo-conservatives are making the same mistakes. They think we can return to the 19th Century when really we should have gone forward again in the seventies. The result for Elvis was tragedy. The neo-conservative experiment will damage all of us, especially the poor. Great, great, great, as Howard was writing this blog Diamond obviously got the vibes and resigned.